Sam Day and Katie Willems, at Silo K-8, near Butler, Missouri, August 15, 1988. Yes, Sam is dressed as a clown, and yes, those are balloons along with all the other signs and banners. A remarkable thing happened in August of 1988, and into the months beyond. Its official title was 'Missouri Peace Planting'. It was an event planned for months, involving many dozens of people over at least four states. The goal: to take a nonviolent public stand against the nuclear missile silos of Missouri. It worked. Those missile silos are now gone, consigned to history. There were too many stories about this action to be able to tell them all, but here is an attempt to tell just a very few of them, from one vantage point. The links below, except items 2 and 3 which link to external sites, are all graphics or .pdfs, not web pages; to return to this page from them you will need to use your browser 'back' button. 2. These two are straight news articles about the last of the missile silos being removed. The wonderful thing about these two stories is that the prayers of nonviolent resistance were answered here. The final explosions at those silos were the explosions that ended their existence as threats, not explosions to end the existence of many other people's lives. "The number and scope of missile silo actions increased in the 1980s as the anti-nuclear/peace movement gained momentum. Anxiety over new missile systems, such as the mobile MX missile, drew 400 people to an anti-MX rally at silo Q5 outside of Cheyenne, Wyoming, in the late 1980s. The furor over the MX deployments focused attention back on the Minuteman as well. 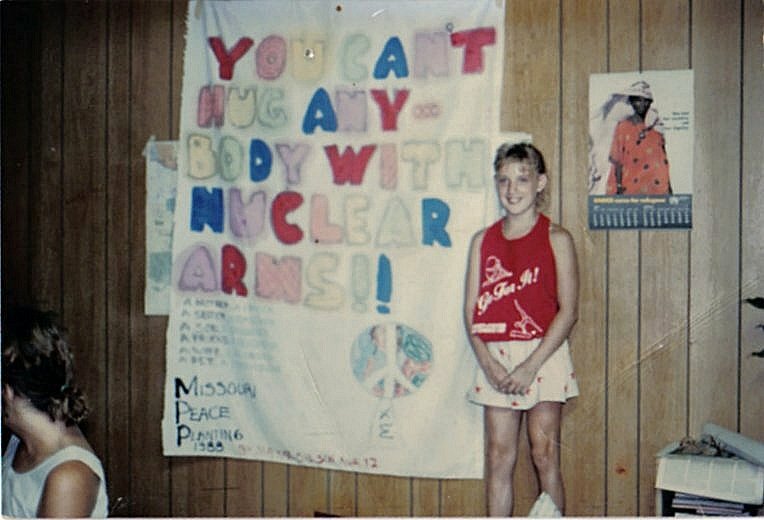 Peace actions occurred at Minuteman II and III missile sites in Colorado, Missouri, North Dakota, South Dakota, and Wyoming during this period. Though no two were alike, protests typically involved vigils, praying at the site or on the silo cover, trespassing, damaging the surface installations by either hammering on the covers or pouring blood on the site to produce a symbolic disarming, or the delivering of statements from the activist to the military. Such statements commonly referred to international laws, such as the Geneva Convention, which bars attacks on civilians, and the Nuremberg Charter, which bans attempts to annihilate whole populations, as the rationale for disarmament. The activists argued that since the effects of nuclear weapons cannot be limited or controlled that they will harm civilians, thus violating these international laws." 4. And now we begin tracking the journey from the beginning, from one person's point of view. The first I heard of this adventure was during a phone call. These are the notes I jotted down on the back of a nearby envelope. The notes are things like 'Missouri - 2 -3 carloads - 15th August Monday'. 5. Nukewatch soon sent out a planning letter. 6. We had a retreat in Milwaukee, to discuss anything and everything about the whole idea. Here is the agenda for the retreat. 7. The initial statement about what we were about to do, and why. 8. Some facts about the minuteman missiles. 9. Two drafts of our own indictment, crafted before the ones that were handed down to us. 10. Planning, planning. This one was from the actual days before, in Kansas City. Who would be where? Who would help whom? And one of the questions we wondered about the most: after months of planning, and so many people involved, and so many missile silos to visit, would the Air Force know we were coming? Bonnie's rendition of the silo-sitting, created later. 11. From the actual day of the event, at silo K-6. This is a drawing to symbolize what we left on top of the site, and the approximate shape of the K - 6 graphic on the silo lid. 12. 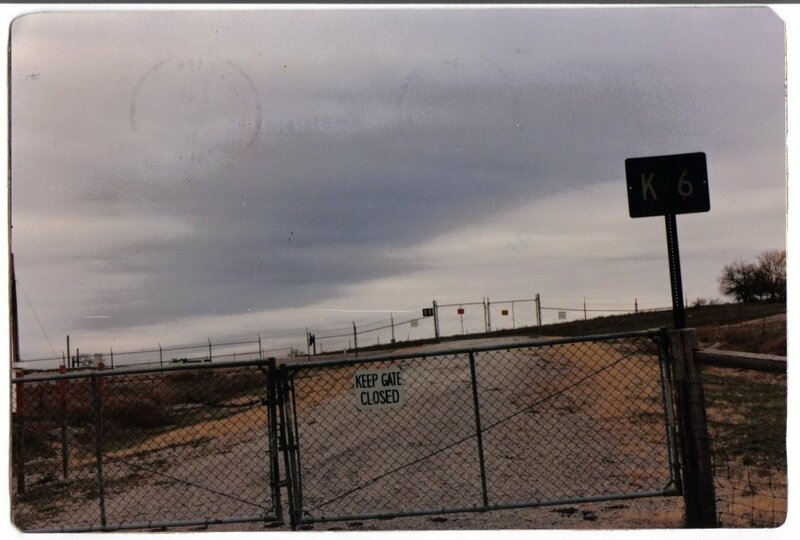 A photo of the front gate of K-6. 14. Our first press release. 15. The Kansas City Star coverage from that afternoon, August 15 1988. The interesting thing about this article is that the graphic was yanked before subsequent editions of the paper went to press. The picture of a young Air Force man holding his rifle in a way that seems to be pointed directly at the head of a silver-haired grandmother, well.... we assume they didn't think that one would be very palatable to the public. 16. The banner mentioned in the above article. Maikke painted it during the days of planning before the event. It was very hot in Kansas City that weekend. 19. The campaign continues! From the Kansas City Star, August 25 and 28 1988: "Missile Protestors Say They Will Visit More Sites", and "Charges Filed Against Three Nuclear Weapons Protestors"
21. My last silo visit was with Bonnie and Duane and Kathy, on August 28 1988. Here are the first and last pages of the indictment August 29 1988. The information goes on and on. By that point the four of us had tallied 13 'counts' against us since August 15th. 22. 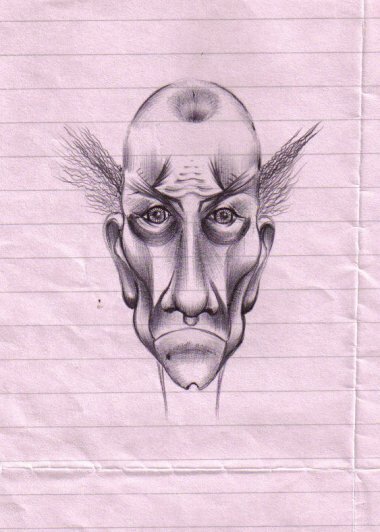 Bonnie's in-court rendering of Chief Magistrate Calvin Hamilton, who presided over the proceedings. 24. The first three pages of the brief filed by my attorney, Delany Dean. It went on from there. It was a brilliant brief. It was so good, in fact, that the day after the court received it, they dropped the charges against us which would have allowed us to appear in front of a jury. They didn't want the public hearing from this lady! Bonnie, having already pled 'no contest' however, did not have these charges dropped against her. 25. This item, also from Delany's brief, is the piece that had the most lasting impact on me: Francis Boyle's article on the Criminality of Nuclear Weapons. He is a lawyer and professor, and therefore very thorough, and uses big words, but what he said rings more true than ever. Set aside some time to read this when you can. I highlighted a few of my favorite paragraphs. 27. Mike Royko's article, May 24 1989: Should Granny Be in The Slammer? The granny he was referring to was Dorothy Eber. She and Bonnie received the severest sentences - 24 to 26 months or more. Plus paper time. Nukewatch required a little restructuring while Bonnie and Sam were away. 29. As for me, I received a sentence of 3 weeks in jail, and probation for 3 years, and $2500 in fines. Hamilton offered me this deal after already sentencing me to six months in prison. He seemed to change his mind during sentencing. Delany later remarked that in 10 years of experience as a prosecutor, she had not seen this happen before. During my regular visits with my probation officer, Wm Badger, I would bring copies of vigil flyers and asked that he insert them in my file. Later the goverment ordered him to remove these from my file. But this I hung onto: my official permission to travel from the U.S. Federal Govt. to attend a Grateful Dead concert at Alpine Valley, in southest Wisconsin. I believe this was the last time the Dead ever performed there. 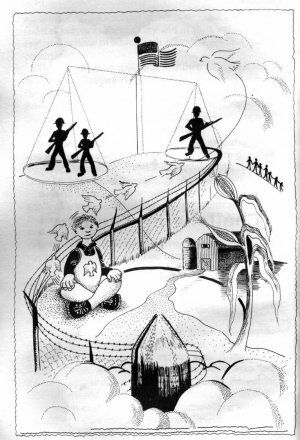 There was a whole book that came out of the experiences of the Peace Planters: Prisoners on Purpose. It is out of print now, but you might be able to obtain an older copy if you contact Nukewatch. AND THE MISSILE SILOS WERE DISMANTLED, AND THEY ALL LIVED - HAPPILY ENOUGH - EVER AFTER. this page - no-nukes.org/mpp88/index.html - created July 3 2007.